Giant Polypore (meripilus giganteus) – Benbow Brothers (Timber) Ltd. 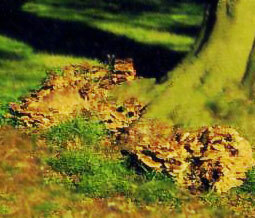 Consequences: Wood becomes soft, may lead to upper root fracture and windthrow. The giant Polypore is inedible but looks similar to Hen of the Woods (Grifola frondosa). The fungal cap produces an enzyme that is being trialed as an anti-cancer drug.